Breakfast or dessert? 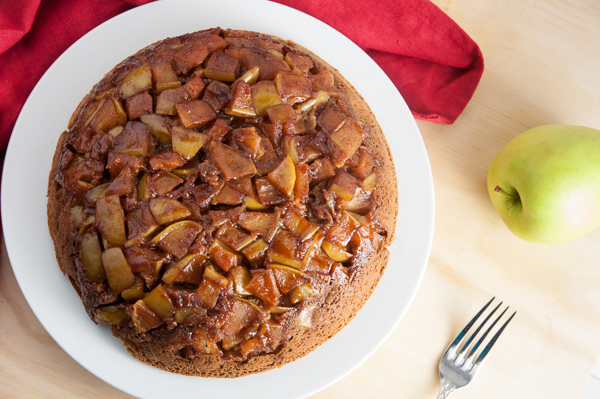 It’s sort of hard to tell with this over-sized Oven Baked Apple Pancake. I originally made it as a breakfast, but it could easily double as a dessert. Let’s back up here a bit further. If you remember from last week, the Goose was sick. Going into the weekend, she still had a hoarse, raspy voice. Otherwise, she acted and played just fine. Her mommy, Jenna, did not do so well. She is proof adults can catch Hand, Foot, Mouth. And she has it bad. So, I’m writing and responsible for the post(s) this week until she gets better. So what’s this have to do with the Oven Baked Apple Pancake? 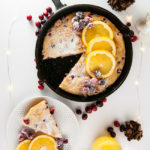 Though you might think it was my time to play in the kitchen (which it was), the dessert-like nature of the oven-baked pancake is something Jenna and I have done numerous times before because it was introduced to us at our wedding shore spot that Jenna has told you about before. And it just so happens this is the time of year we typically make oven-baked pancakes. It was merely a coincidence that Jenna was sick. But it was not a coincidence that I chose this weekend to make it. Why? Because I can get it together very quickly with an animated toddler and sick wife. Really the hardest part is cutting the apples (which I short-cut quite a bit with the apple slicer). The Goose was quite helpful with this recipe. She slept in. I had gotten up with enough time to mix up the batter, prepare and cook the apples, and get the pancake in the oven before she stirred. When she did wake, she was daddy’s little helper with getting some pictures of the pancakes. That is often the hardest part when she is around for pictures. She always just wants to eat the food. I can’t say I blame her on this one – it pretty much tastes like a dessert but it’s an easy make ahead breakfast. 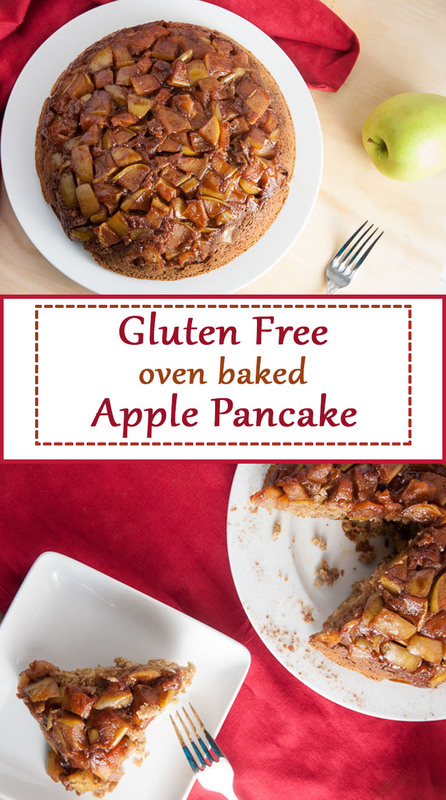 Even better for our household, it’s both a gluten free cake and gluten free pancake rolled into one. (Don’t worry if you aren’t gluten free- just sub all purpose flour.) But she does not yet quite grasp the need to wait until after pictures are done to eat. Eventually, that is a goal. But for now, when needed, she can wait a couple of minutes. Or take it. If she is around, that’s usually how we know we are done with pictures – the food disappears. Cut apples into small pieces, use an apple slicer to get wedges and cut the wedges apart. 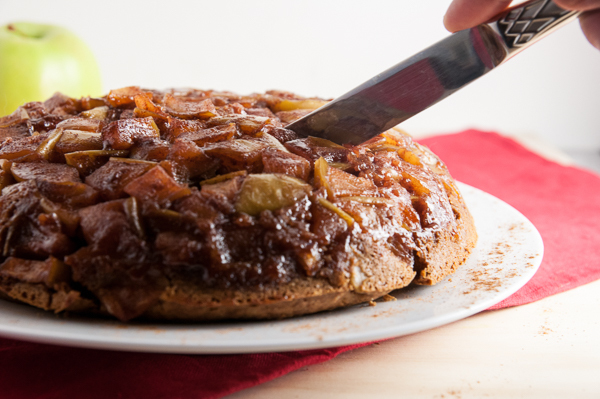 Cook apples for about 10 minutes or until they are no longer firm and a sticky syrup has formed. 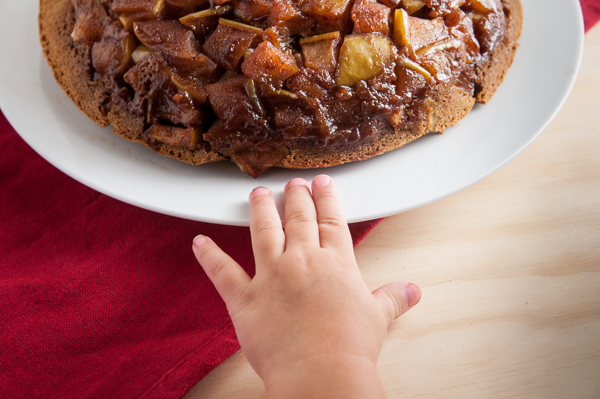 While apples cook, combine the dry ingredients ( flour, baking soda, baking powder, and cinnamon) in a medium bowl. Combine the wet ingredients (creamer, brown sugar, egg, and vanilla) in a small bowl and whisk. Add wet ingredients to dry ingredients and whisk until combined. Spray a shallow, oven-safe dish with non-stick spray. Add apple mixture to bottom of pan and spread out evenly. Pour batter on-top of apples. Bake for 45-50 minutes or until a fork comes out clean. This looks amazing! 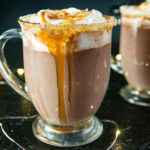 I’m cutting out sugar for a month, but after this month, I think this will be the perfect treat! Thanks for posting! Whoa. Kudos to you Julie. I tried that back before I had my kiddo and now I am pretty sure my personality is fueled with coffee and sugar. I love pancakes, this is something I would love to make. It looks so good! thank you for sharing. Wow, these pictures look mouth-watering. 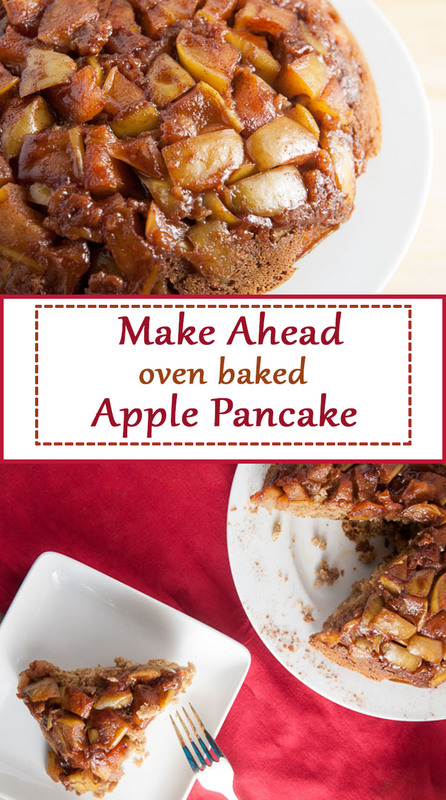 I love both apple pie and pancakes so this seems like the perfect combination. This sounds incredible! 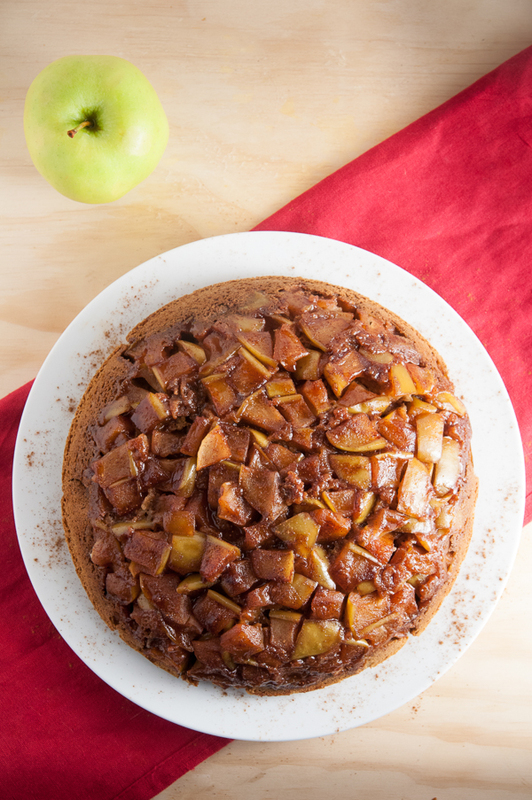 I love baked apples, and I can’t wait to try this oven baked apple pancake this Fall. Yum! This looks so tasty! I love apple anything! Oven baked? Apples? Pancakes?! YES PLEASE! YUM! This looks so delicious! I want to make it tonight for dessert! What!!? This looks SOOOO yummy!! I must make this STAT! Thanks for sharing!! Oh my goodness!! That’s the biggest pancake I’ve ever seen! I bet it tastes like pie. Yes it does! 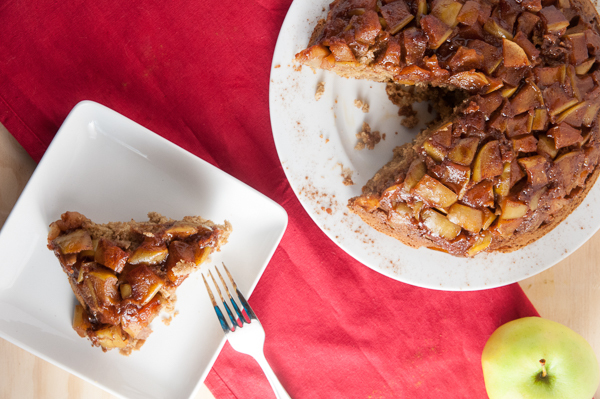 Glorious apple pancake pie! This looks so yummy! I want some now! Omg I love all these awesome apple fall recipes I’m seeing. 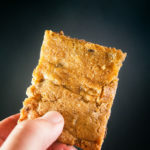 We went apple picking and made applesauce and fruit leathers this year! Ohhh fruit leathers! That sounds fabulous! These look delicious. I want to eat them right now. This looks so good! What a fun breakfast that doesn’t take forever to make! delicious! love the carmelization of those apples too! It’s what makes this pancake so perfect! 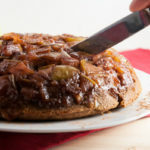 Oven baked apple pancake looks so yummy! I’ll be eating it for breakfast, lunch, dinner and dessert! Can hardly wait to whip it up! Ohhhh with a scoop of vanilla ice cream and some caramel sauce. YES. Game ON! 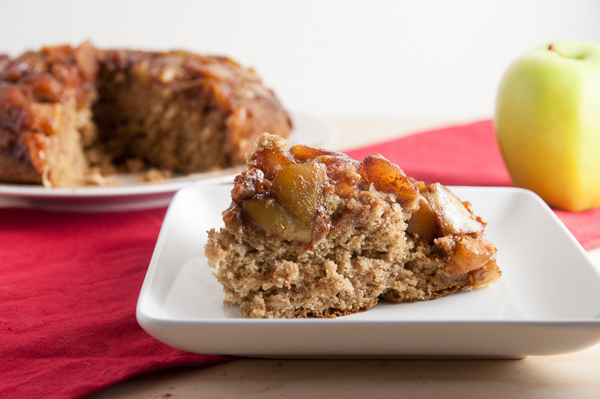 I am crazy for apples so this is a must-make for me! YUM. This looks to die for!! I love your pics! Yum! This looks so delicious! What a great treat on a chilly fall morning! This looks amazing! My 4-year-old son would love this! Lol my 2 year old LOVES it and she’s going through a picky phase. Thank you! I’m so glad you liked it Rizza! This looks so delicious! I love anything with apple! This looks delicious! I feel like the Apple is the unsung fall hero. Bring on the apple goodies! This looks so delicious! What a great idea, can’t wait to try this out! 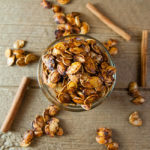 This sounds amazingly perfect for Fall! It looks so fluffy and flavorful. Wow! Thanks for sharing such an incredible recipe. I can’t wait to try it. Yum!